Ok so who wants to get their Gelli on? Well DIY Gelatine plate actually! You guys must have seen all the lovely monoprinting blog posts with the Gelli Arts Printing Plates around and about over the last few months I’m sure? If you haven’t spotted them and don’t know what I’m talking about then Gelli Plates are a synthetic gel surface that you can use for monoprinting with, which is a printmaking technique that gives a unique print – hence mono or one. The Gelli plates are based on an old school technique using Gelatine (or Gelatin) plates used for years. The benefit of Gelli Plates (as I understand it ‘coz I don’t have one) over those made from Gelatine is that it is quick, non-perishable and reusable. But Gelli Plates do come in at a bit of a price (6″ x 6″ ~£19.99; 8″ x 10″ ~£29.99 well at least in the UK). Obviously if you use monoprinting a lot in your art you might be very happy to have a Gelli Arts Printing Plate. I’ve been wanting to try monoprinting for a while now and the recipe has been open in a tab on my browser for ages so when I saw all those lovely monoprints on blogs I was inspired to get my finger out finally and try a bit of monoprinting! But I thought I would go the cheaper route for the time being, ~69p for 70g Gelatine! So if any of you are wanting to dabble in monoprinting or see if Gelli Arts Printing plates are for you but don’t want to risk the cost then stick with me for a cheaper option, well at least until you find you can not live without a Gelli Plate that is! Ok, so what will you need? These are the measurements of water and Gelatine you need for a tray the size mentioned above but you can use any size you want just alter the recipe (see below) and if I was you I would use a disposable foil tray (I’m going to try that next time myself). 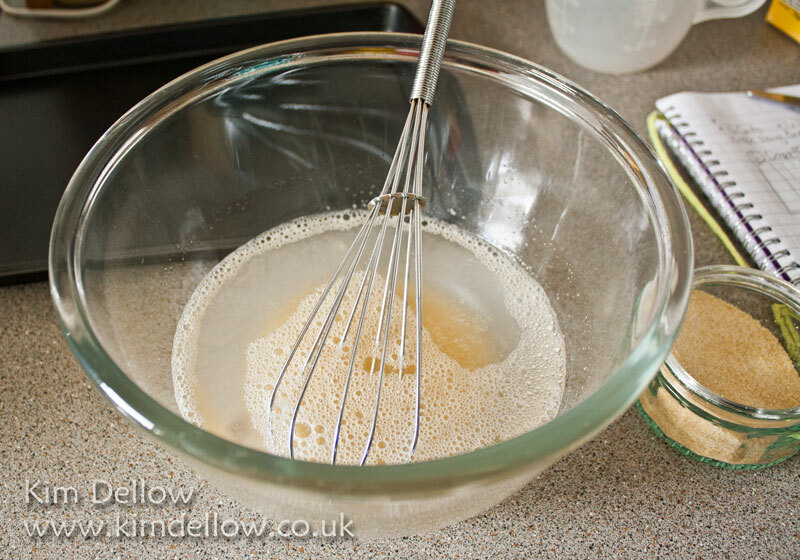 But bear in mind that the Gelatine will take on the shape of the container and if you want to use both sides of the gel then you might need a smooth container. I got my recipe from this quick YouTube video from Linda Germain and from Amanda Gordon. 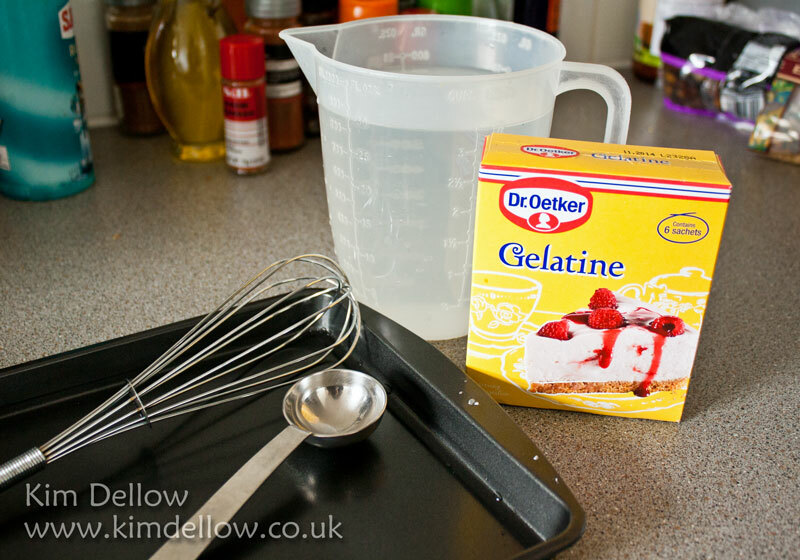 Their general rule of thumb is 2 tablespoons of Gelatine for every cup of water or 24g Gelatine for every 240ml water if you prefer metric (but it is a very approx conversion!). First start dissolving your Gelatine in the cold water and I added my Gelatine in parts to the water to help it dissolve. Then mix the hot water in well. 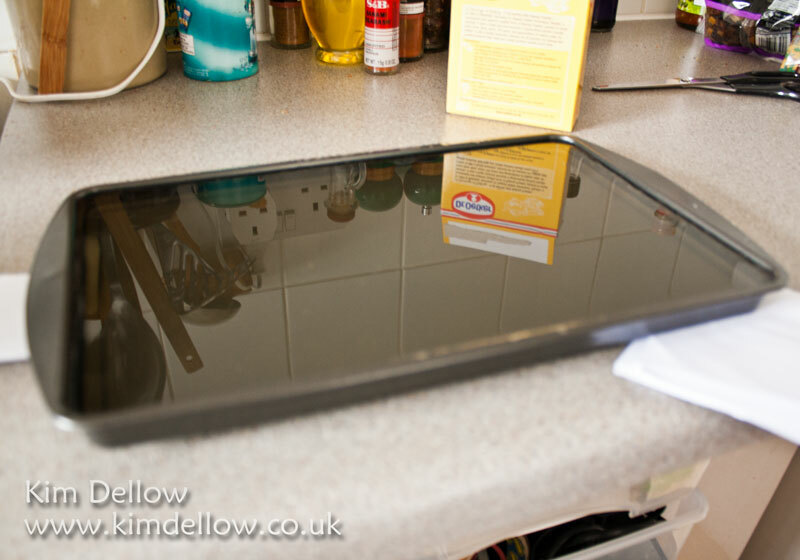 Use a spare piece of paper to skim most of the foam off and pour into the tray to around 1.5cm thick. Skim off all the bubbles with a spare piece of paper and let it cool to set. It didn’t take long, around a couple of hours and I was using it. I think you can put it in the fridge if you need to. Once it is firm to the touch you can get your printing on! You will find a brayer or two very useful and then things for making marks, or masks, or fun textures. So things to try are paper, paper cut into shapes, packaging, string, paint combs, texture brushes, corrugated card, well the list is endless really! Acrylic paints are perfect for monoprinting. But you can try oil paints and inks just be aware that they may effect the surface – dyes stain the Gelatine but doesn’t interfere with the print making. Cover the surface with paint and use the texture makers to add interest, then layer the paper onto the surface and smooth down before peeling off. I made quite a few prints, as you can imagine. The great thing is that you can just keep going, although I might have been a bit rough on my surface as I did end the day with a couple of nicks, but I wasn’t too concerned, I’ll still give it a few more uses. Apparently the Gelatine plate will remain usable for around 3-5 days and I’ve covered it with cling film (Saran wrap) and placed it in the fridge (wonder how long before that gets noticed?). The first sample, top left is acrylic paint on fabric, the rest are on paper, there are some metallic paints in there too. Yep it is FUN! and yep I would do it again with my Gelatine plate, it is much easier than it looks. 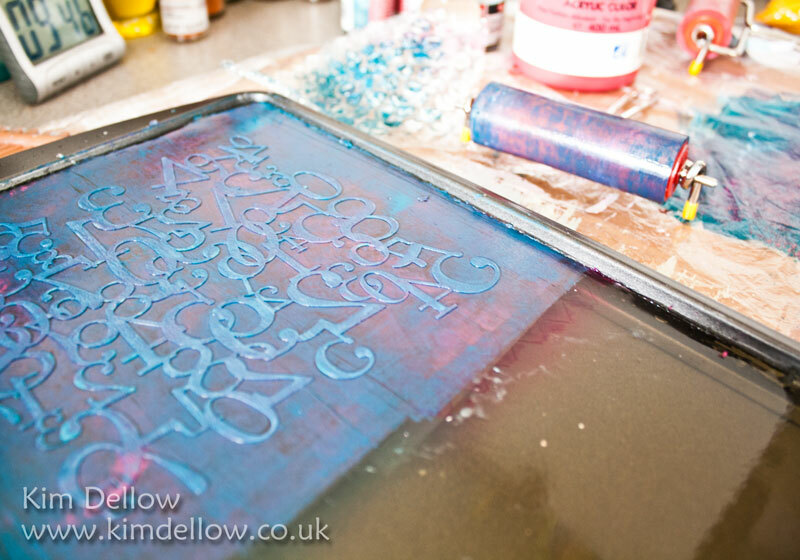 Still on the fence about buying a Gelli Arts Plate, but if you have one I would love to know what you think of it! Before I go if you are looking for an even cheaper, even simpler and even vegetarian (well as far as I know!) method? Then check out this YouTube clip from JenniBellie, gonna need to try that too! Have fun re-acquainting yourself with monoprinting techniques! Excellent! Modern manufacturing is clever but being reminded about the grassroots of art is really interesting. I am not a very messy crafter – keep meaning to get down to it but then some card orders come in! Very inconsiderate of clients not to let me play! oooh ….. this looks like fun. Great prints, love the colours. I've been looking at the Gelli plate for a while (amongst other things). I haven't made my mind up whether I NEED one or not yet. Thanks so much for your kind visit. I was just asking about this technique, as I kept seeing pieces done but had no idea what it was. Looks fun! Love your backgrounds! So glad you shared the how to and gave me a clue! Enjoy the day! Great tutorial! Have the Gelli Plate but would have loved o have seen your video first! Thanks for dropping by my blog today. This looks very cool. I definitely want to give it a try! Thanks for visiting my blog today and leaving such a nice comment. Those prints look awesome. Great blues and patterns, love them. I have two plates, the small one and the middle seized one (don't know the exact measurements at the moment). Yes, they're quite expensive and still not available here in Germany. I wished for the bigger one as a birthday gift 🙂 I certainly don't want to miss them. It's such great fun – as you discovered for yourself 🙂 – and I can make lots of quick and unique backgrounds. I'm no art journaler and use them for cards and TAGs mostly. Even my children (10, 9, 5 – therefore I like 'quick' solutions *lol* I don't have much time left for myself) love to use the plates. I didn't regret to have purchased them for a moment. Thank you for your lovely comment on my Moo. You have a fabulous tutorial on the mono printing. Thanks for sharing. I'm lucky enough to be going to a workshop in May and the Gelli Plate is included on the price 😉 can't wait! Your backgrounds look wonderful, it's really a great technique. I don't own the original gelli plate but a cheaper alternative (kind of a hot glue gun mat), it works the same. Awe Kim, thank-you so much for your very kind visit. Lol, how on earth did you find my little blog? Love your post today, this is a technique I've been wanting to try for ages but I couldn't justify spending out on a Gelli plate, this way I would be able to easily afford to give mono-printing a go. Your prints turned out beautifully, what a splendid addition to your stash. This came out brilliantly, it is a technique I wanted to try for AGES! Thank you for the encouragement. wow Kim "this" is Brilliant – outstanding – gosh I love it Thank you so much for sharing – and I need to follow this blog to not miss a thing! Very pretty prints you came up with! I have yet to try this even though everyone makes it look so very easy. thank you for this great post! I've been wondering why shell out the money when you can do this…or even use a piece of glass. Love your papers, they turned out terrific! Hello Kim!! and thanks for coming to visit. Love your monoprint and technique – thanks for sharing. The acrylic on fabric is amazing – great colors too. Thanks for this fantastic tutorial. 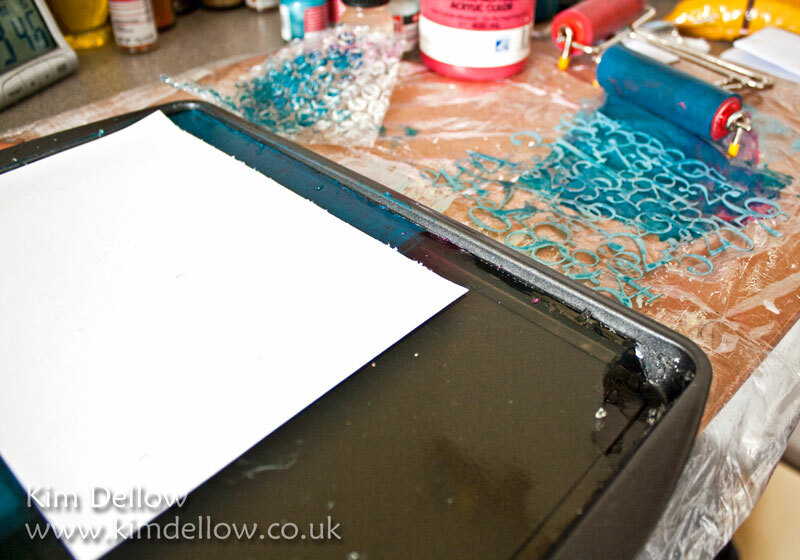 It's a great alternative to the expensive gelli plates. Your prints look fantastic, Kim! I'm so glad you stopped by my blog for a visit so that I could find you. LOVE the technique and your DIY version! What a great way to achieve stunning effects! Wow! This is amazing! TFS! I must give this a try! Hi Kim this is amazing never heard or have seen this techinique,but I am going to give it a try ,thank you for the inspiration. Your prints look fabulous Kim! I do have a Gelli Plate, & find it very good. I'm not sure I would have the patience to make my own! Lol! Thanks Kim. Might give that a go as a play piece to see if the cost is going to be worth it for me. You got some great results. I get messy enough just playing with my gelli plate, let alone having to make a 'real' one first :-)I am loving your prints, Kim. Look forward to seeing what you make with them. Oh Kim this is utterly brilliant!!!! I have been looking at all these gelli plate backgrounds and not been convinced by them at all at that expense. This on the other hand is a really wonderful creative solution and the results are simply stunning!!! I am definitely going to give this a try, thanks so much for the clear step by steps and the links to the videos! Can't wait also to see what you are going to make with these great prints!! 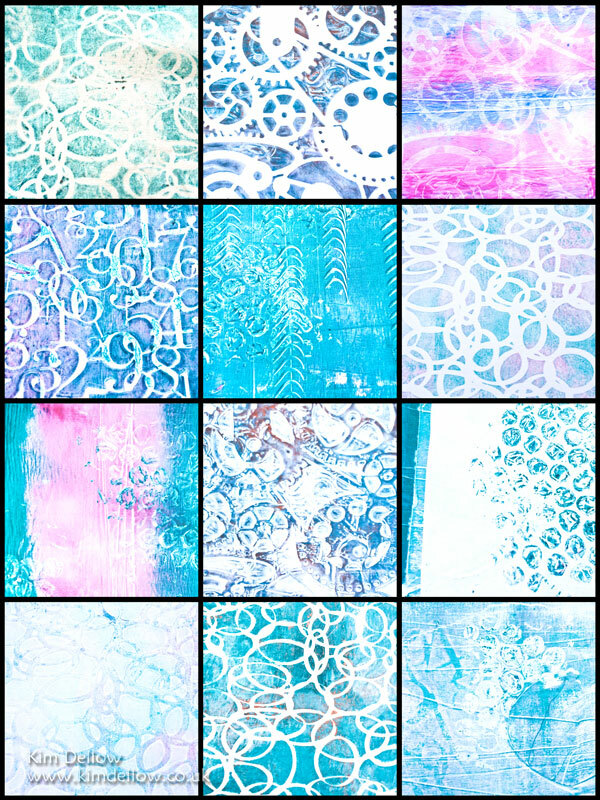 Hi Kim, thanks for popping by to La Dolce Vita for a visit… your gelli prints are great and your tutorial was excellent! What a glorious way to get messy and create beautiful backgrounds. One to try during the next half term I think. Looks great fun, relatively easy, and cheap! I love it! Thank you for the comprehensive tute. Thank you so much for the tutorial and the cheaper option. Your prints came out so well. Now do I buy the Lime or the Strawberry jelly?! A fantastic post Kim, love the original gelli plate you have created and all the prints come off it. I have to say for quickness I love my bought gelli plate, but yours is just as effective and what a price lol. If you make it up with half water and half glycerine it will last for a very very long time and no need to refrigerate! Thanks so much for posting this, I'm on the fence about a geli plate too, but this looks well worth trying to see if i love the concept. I just linked to this on UK Stampers forum and also to another video where the author makes a permanent version of the plate. Do make sure and read her comments thou as she makes some alterations to her original recipe. thank you… just what I needed to know. Thanks Maxine that is great and I can not wait to see the results of your printing. It's in the fridge…..which was tricky to do without spilling….so cant wait to try, tomorrow probably….! Exciting! I think I might have to make another one – I'm feeling the urge to print! all very excited and about to try it out……when i remembered I haven't got a brayer yet!!! lol!!! ok, hope it can wait another day or so!! I do feel like a ninny! So how did it go? Has the brayer turned up yet? That is so what I would do too LOL! Hope it has and that you have had some printing fun.